Technology lying around your house, including the Xbox Kinect sensor and cheap cell phone parts, could one day become part of a life-saving drone. 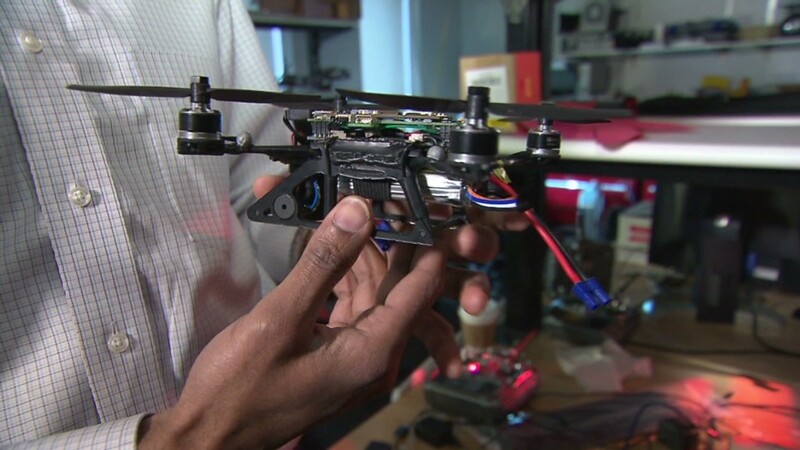 Cheap and off-the-shelf technology make up the key ingredients in some of the Unmanned Aerial Vehicles (UAVs), or drones, under development at the University of Pennsylvania's General Robotics, Automation, Sensing and Perception Lab. Researchers at the "GRASP" lab are trying to develop inexpensive drone technology that could rescue people from life-threatening situations. Drones have gained notoriety for everything from precise military attacks to flying spy cameras. But unlike drones used for military purposes, GRASP Lab's robots are meant to go inside buildings. They can map rooms and hallways. To do that, some of the drones use sensors from the Microsoft (MSFT) Xbox Kinect. The Kinect generates a 3-D map in a three- to five-meter range, which is useful for locating obstacles. Constructing the drones using ordinary tech components saves money -- and the lab wants each robot to be cheap, because they want to produce a lot of them to fly in fleets. "It's extraordinarily easy now to find low power, inexpensive processes that can do all the computation that you need," GRASP Lab's Prof. Vijay Kumar said. "You think about the hardware that goes into your smartphone, well it's roughly the same kind of hardware you need for sensing, processing, and controlling these UAVs." GRASP Lab's drones contain processors similar to the ones you would find in a smartphone. A human interprets the data that the aircraft sends back, and then gives instructions to the drone. The miniature motors that power the drone's rotors are also available off the shelf, primarily used by hobbyists. The results can be impressive. GRASP has produced viral videos in which drones do things like play the James Bond theme song together on a piano. But Kumar envisions a much more serious use-case for the technology. "We think of these as being the first responders," Kumar says. "When there's an emergency, we want people on the scene ... the idea is it gets to the scene before a human first responder can." The technology is still being developed. Kumar's team tested the robots in the aftermath of the 2011 earthquake and tsunami in Japan. They were deployed inside collapsed buildings to map interiors, determine structural integrity, and look for victims stuck inside. What makes the drones in Kumar's lab distinctive is both their small size and the idea that they would travel together. The typical limitation with smaller drones is an inability to carry large payloads (cameras, weaponry, etc.). By working together, payload weight can be distributed across the robots. Kumar's drones are also able to act as fully autonomous robots. Drones are growing in popularity, though it will be illegal to fly them for commercial purposes until 2015. Over eighty universities and local law enforcement groups applied to the Federal Aviation Administration for licenses to fly drones in 2012, according to Freedom of Information requests made by the Electronic Frontier Foundation.